I’ve already touched on this in one of my previous blog posts, but when using that solution I sometimes run into ARP and routing problems that while surmountable, weren’t the most intuitive problems to solve. TAP interfaces and vmware ESX server gave a much more stable and easy solution. 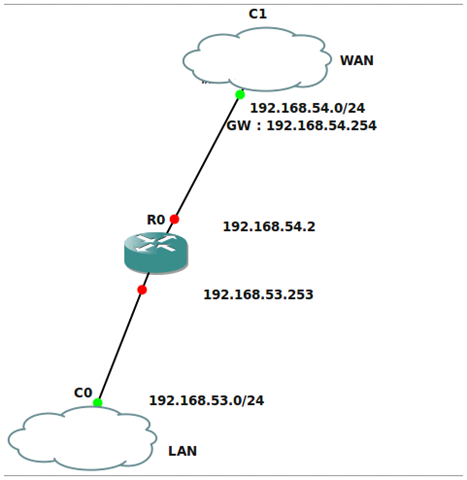 In this article, we basically run the virtual cisco router in a GNS environment hosted on a linux machine. I went with a standard linux distribution (ubuntu) for one major reason, which is that linux supports more than one interface bridge, whereas in windows XP for example, you can only define a single interface bridge. Since the virtual cisco router has 2 interfaces in the above diagram, we need 2 interface bridges. So the first step is defining all the nodes we’ll need in the above. As a virtual client (the virtual PC in my diagram above) I chose to use windows XP, and so provisioned a VM with that OS. Next, I provisioned a VM using ubuntu and 2 NIC cards. Depending on how many interface your virtual cisco will use, you will need to define as many NIC cards on the host. For example, if you want to add a virtual DMZ to the cisco, you will need 2 NICs defined. Next, we go on to define the virtual network in ESX. In vSphere, click on the ESX server > configuration tab > networking. 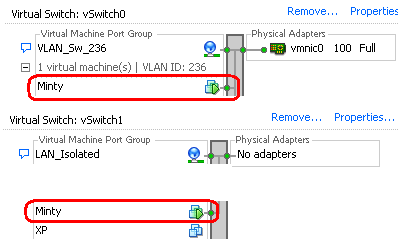 You should already have at least one virtual switch (vSwitch0 in the screenshot above), which is already bound to a physical adapter (vmnic0 in the screenshot above). You will need to define another virtual switch, from the “add networking” option, and take care not to bind this to any physical adapter. In the above screenshot, Network adapter one is going into the switch which has a physical interface bound to it, so this will represent the link between the cisco and the physical network. 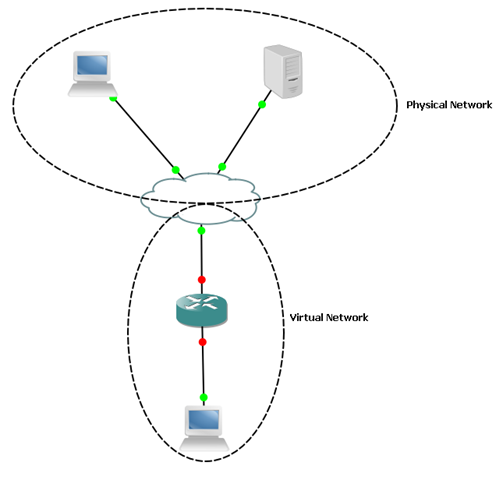 The 2nd network adapter represents the link between the virtual cisco and the virtual client (windows XP). Notice how “Minty”, my linux machine, is connected to both the switches, while the XP VM is connected only to one switch. You answered a whole lot of uncertainties on my bridge set up. Kudos for the well written blog!